Waititiko Meola Creek’s environmental health suffers from frequent overflows of around 1 mill cubic meters of stormwater and wastewater annually. 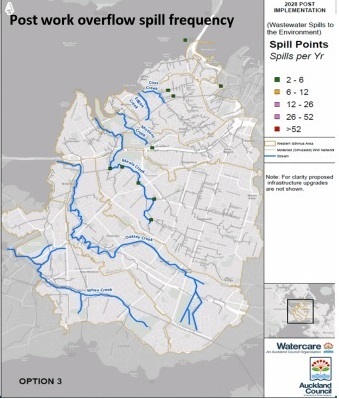 It is stormwater which fuels the majority of Auckland environmental overflows, and this is the responsibility of Auckland Council and Auckland Transport, though on Auckland isthmus these organisations pour undisclosed amounts of stormwater into the wastewater network run by Watercare (“combined sewers”). This diagram shows the current overflow points on Auckland isthmus, including those on Waititiko Meola. There are a few initiatives under way by government bodies which may lead to some improvements. These organisations often refer to “Three Waters” meaning: – drinking water, sewage and other waste, and stormwater which arises from roads and urban hard surfaces. Auckland Council’s promised “Three Waters Strategy” work has been going for 18 months or more. Now labelled a discussion paper and published on 4 December: 3 Waters Discussion AC Public consultation will be held in February-March 2019. Ministry for the Environment produced “Essential Fresh Water” in October 2018. The last of these covers regulatory reforms, as well as possible reduction of the number of suppliers of drinking water and waste water services. Auckland and Wellington may be least affected because they each already have one large service supplier – Watercare and Wellington Water. The paper stresses that water will remain in public ownership, but that current standards are not enforced and not met. There is much discussion about costs and funding. Of most interest for Auckland are planned: measures to give greater transparency around the operation of wastewater and stormwater systems, and to promote better practice. This offers some hope that the water reforms will extend beyond the basics of drinking water and wastewater which are reasonably well managed in Auckland by Watercare. The Auckland Council paper proposes a vision for 2050: Te mauri o te wai o Tāmaki Makaurau – the life supporting capacity of Auckland’s waters – is protected and enhanced. It is very high level, discussing water values, issues, principles and processes. It mentions combined sewers, but also claims Auckland Council is: capturing and cleaning stormwater before it reaches the sea. It does not specify where or what volumes are cleaned. The third paper, Essential Freshwater only touches on stormwater, largely delegating Auckland problems to Auckland Council while focussing on larger rural rivers. It mentions: it is anticipated that a separate paper will be presented to Cabinet in due course on wetland and estuary protection. The proposed NPS on Indigenous Biodiversity could be an important tool for protecting wetlands. How far will it be into the future before we see any standards here? One scenario is that the two Government initiatives will focus on regulations and changes which improve drinking water and wastewater outside Auckland and Wellington (for around 50% of the total population though covering most of the area of NZ). Given Auckland Council is already pleading for special purpose vehicles to move approved Watercare spending off its books, it seems unlikely they will spend more on stormwater and combined sewer issues without requirements and standards from central Government. Auckland Council claims in the next ten years, we expect to invest $7.1 billion in diverse water projects of all sizes across the region. It also states: Between now and 2048, we expect to have spent around $35.7 billion on water infrastructure. After lobbying from residents and environmental groups, Auckland Long Term Plan made a start by approving $452 million for spending on stormwater. Council has committed to reduce the volume and number of stormwater overflows on Auckland isthmus, including some separation of combined sewers. They are very clear that Meola catchment is “difficult”, which appears to mean expensive to separate. 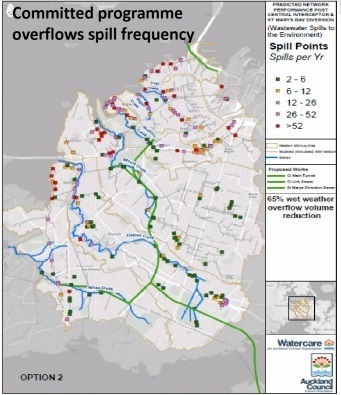 This diagram shows Auckland Council’s promise to achieve just 10 remaining overflow points, 5 of which are on Waititiko Meola Creek. The Central Interceptor is expected to take approximately 800,000 cubic meters more fresh water away from Waitemata Harbour and divert it to Mangere Waste Treatment Plant (MWTP). Manukau Harbour residents rightly claim they have a salt water environment, and MWTP is already the largest freshwater river discharging into the Harbour. STEPS has made it clear to Auckland Council that ratepayers expect local stormwater treatment. Ideally this means water sensitive design techniques such as rain gardens (see more here ). It should also mean more wetlands, both private and public on the large areas underlain by aquifers. And it will need significant improvements in the monitoring of compliance and the management of the discharges to the aquifers via “soakage” by Auckland Council Healthy Waters, and Watercare. Led by SASOC, Aucklanders have communicated to Auckland Council that the status quo for our storm water and our local environment is not good enough, and that Aucklanders expect their city to match up to the standards enjoyed in Melbourne, Adelaide, Sydney, Wellington and Christchurch. This will require ongoing spending – probably of the order of magnitude that has already been committed to roads and transport. Ratepayers will have to communicate the need and citizens’ expectations clearly to Auckland Councillors and the Mayor to make that happen. Watercare selected Ghella-Abergeldie Harker Joint Venture as preferred bidder for the construction of the Central Interceptor project. Watercare says ” The joint venture of Ghella and Abergeldie Harker has over 150 years of Italian and international tunnelling experience and ability – ensuring the utmost skill and competence in the delivery of our project. Ghella has successfully completed numerous projects of this scale worldwide. These include the Legacy Way tunnel project in Brisbane which achieved world records in tunnel boring machine excavations. Currently, Ghella is working on some of the biggest tunnelling projects around the world, including the Follo Line in Oslo, the Sydney Metro and the Riachuelo sewage system in Buenos Aires. Abergeldie Harker has successfully delivered complex underground construction projects across New Zealand over the past four decades and is one of New Zealand’s foremost shaft sinking and pipejacking contractors. Its parent company Abergeldie is one of Australia’s leading three waters contractors with extensive experience working on major water and wastewater assets throughout Australia.